Our newest design, ExtendaShroom, is especially created for those of you with really green thumbs. We are pleased to announce that we have new outdoor lighting additions …Grill Lights, Flower Pot & Mini Path Lights ... great styles that every home or garden can use. Be sure to check them out. We now do custom low voltage lights, if you want something a little different than what you see in our catalogue, contact us and let us know. Enjoy the charming glow of these hand-crafted copper lights throughout your landscaping; or beautifully illuminate your sidewalks and pathways to create an inviting entrance to your home. Easily transform a simple water feature into a magical oasis when you select a copper accent light from our unique pond light styles. The inherent aging and patina process of raw copper will always lend to the organic beauty of the surroundings, in addition, all of our designs are low voltage outdoor lighting, ready to install, and weatherproof for extended outdoor use. Each CopperScapes low voltage light is a genuine, artisan creation that will naturally enhance your outdoor living space. 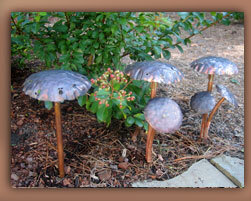 It is the affordable solution to your low voltage landscape light needs.